Engagement season typically lasts from Thanksgiving to Valentine’s Day, and if you’re active on Instagram and Facebook, I’m sure you saw plenty of pictures with rings, hugs, and hearts over the last few months. And now that many have found “the one”, next comes the excitement of wedding planning! Almost as important as the dress, you and your partner may be searching for that perfect wedding venue, and more often than not, your desired venue is near the beach. There’s something magical about beachfront wedding venues, especially in California. They illuminate unparalleled beauty and dramatic sunsets, which are ideal for all those cherished wedding photos! If you’re newly engaged and looking for that perfect wedding venue near the California coast, then you’ve hit the jackpot. Pacifica Hotels offers some of the most scenic, yet affordable wedding venues along the California Coastline. Browse through our beachfront wedding venues by Pacifica Hotels and discover your perfect spot to tie the knot! With expansive ocean views and scenic bluffs as your wedding backdrop, Pismo Beach weddings are simply unforgettable at Spyglass Inn. 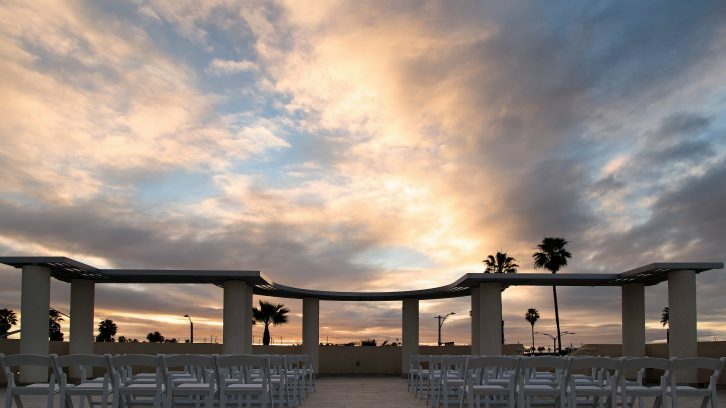 They offer an oceanfront banquet room – perfect for wedding receptions – as well as outdoor event space for wedding ceremonies overlooking Shell Beach. This lovely lawn makes the perfect choice for both a garden and oceanfront wedding ceremony. In addition to choosing their beachfront wedding venue in California, Spyglass Inn offers 82 just renovated guest rooms for your out-of-town guests. 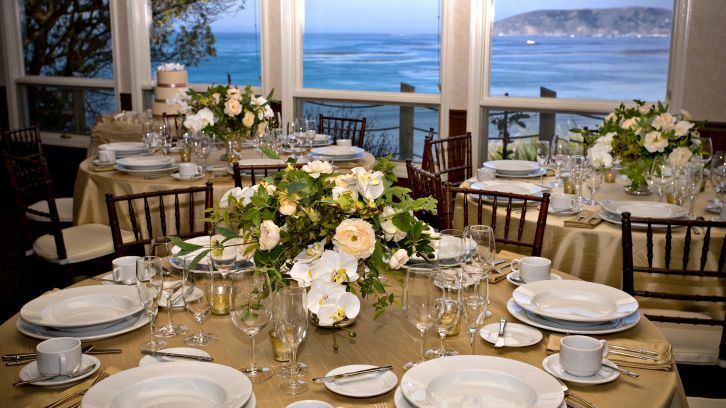 Learn more here about Spyglass Inn’s wedding venues along the beach here. The Marina del Rey Hotel is home to beautiful, newly renovated wedding space that offers spectacular marina views. The Regatta Ballroom can accommodate up to 275 people with flexible seating arrangements and connects to Edgewater for additional reception and cocktail space. Their marina-facing Event Lawn is perfect for wedding ceremonies along the water, which offers unparalleled views of the sparkling harbor and boats passing by. Also located outdoors next to their infinity pool, the Garden Poolside is great for smaller Marina del Rey wedding receptions. 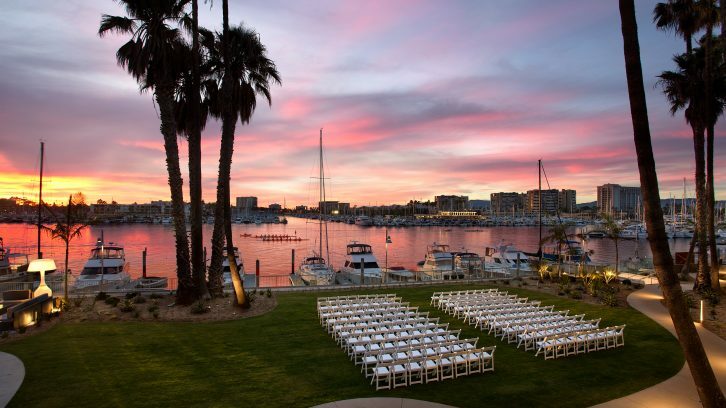 Learn more here about the Marina del Rey Hotel’s waterfront wedding venues here. Beautiful beginnings start at The Belamar Hotel in Manhattan Beach, home to some of the most beautiful, yet affordable weddings in Los Angeles. They offer truly soulful soirees – held in either an indoor or outdoor setting – that are ideal for both intimate occasions and larger-than-life affairs. 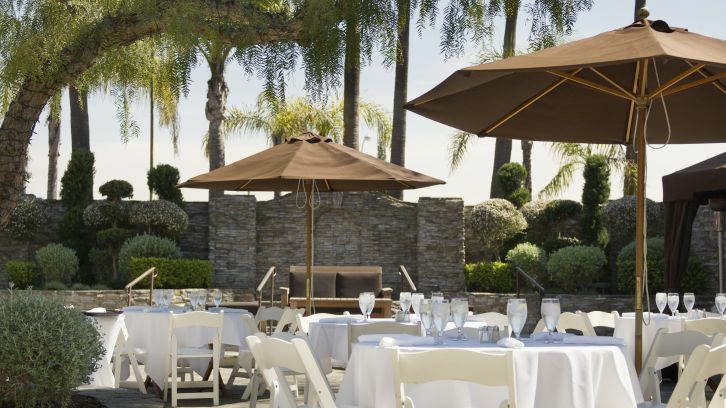 Their Manhattan Beach wedding venue, the Sunset Garden, offers a lush outdoor garden setting that is idyllic place for intimate ceremonies and relaxed receptions for up to 200 guests. Inside, you’ll discover our Sunset Ballroom, where you and your guests can dance the night away in over 2,000 square feet of open space with elaborate cathedral-style ceilings. Learn more here about The Belamar Hotel’s wedding venues in Manhattan Beach here. At the Jamaica Bay Inn, they offer a West Indies-inspired waterfront wedding venue as the perfect backdrop for an island-inspired wedding. Lush gardens, the sparkling waters, and golden sand beaches are just steps away, which are illuminated by fire pits and the cool breezes at night. Ideal for intimate dinners and ceremonies, Jamaica Bay Inn can accommodate up to 60 guests on your special wedding day. Your out-of-town guests will also appreciate this treasured venue as they celebrate with you and enjoy exquisite accommodations. Most of their rooms and suites feature private balconies and all offer free WiFi, plush robes, gourmet coffee, room service, and luxurious beds. Learn more here about the Jamaica Bay Inn’s waterfront wedding venue in Marina del Rey here. For a memorable wedding day with California finesse, the Hilton Garden Inn invites you to plan your Los Angeles wedding with them. Located across the street from Mother’s Beach, their wedding venues are stylish and affordable, while still offering easy access to scenic, picture-taking locations on the marina. In addition, they offer two suites that are perfect for bridal parties to get ready in! Allow their creative wedding planners to see that every detail is met, from choosing the right indoor or outdoor venue to configuring seating arrangements and recommending food. Then, complete your special day with delicious onsite catering and state-of-the-art AV equipment. At the Hilton Garden Inn Hotel, they ensure that your wedding near the beach will run smoothly from beginning to end. 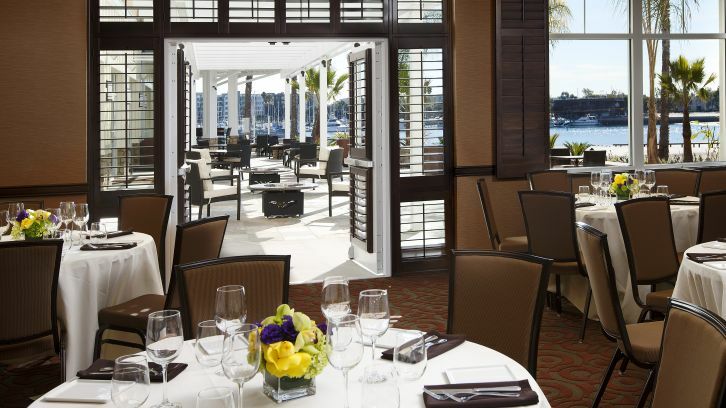 Learn more here about Hilton Garden Inn’s wedding venues in Marina del Rey here. Plan your wedding along the Southern California coastline at The Redondo Beach Hotel, which just completed a full renovation. Here, they offer two indoor wedding venues – the Promenade for up to 100 guests and the Topside for 45 guests – which have all been recently remodeled in 2015. In addition, they offer up to 2,700 square feet of outdoor event space on their second floor patio, which boasts plenty of sunshine and fresh marina breezes for you and your guests to enjoy. Coupled together with their Promenade venue, the Rooftop Terrace can hold up to 145 wedding guests. Learn more here about The Redondo Beach Hotel’s wedding venues in Redondo Beach here. If you’re interested in a Hawaii destination wedding for your big day, then look no further than the Courtyard King Kamehameha’s Kona Beach Hotel. 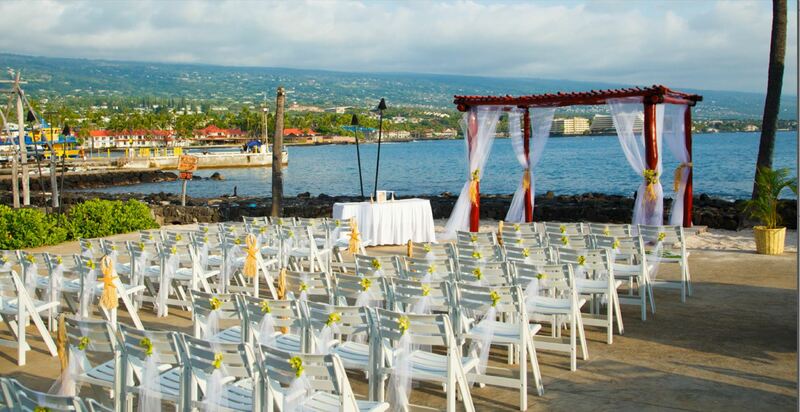 Rated a “Top 10 Wedding-Worthy Hotel for Hawaiian Weddings on any Budget” by Destination Weddings & Honeymoons Magazine, this Kona Beach Hotel offers a wide selection of wedding packages to fit all your needs – from a private exchange of vows to the complete royal treatment. With inspired ocean views, towering palm trees, and the sun and sand as your tropical backdrop, they offer 20,000 square feet of event space on the Big Island. In addition, their breathtaking wedding locations in Hawaii also include the historic King Kamehameha’s ceremonial site, facing the beautiful Kailua Village and Hualalai mountain range. Extending the aloha spirit with attentive service, their Hawaii wedding professionals are here to help every step of the way. Learn more here about the wedding venues at the Courtyard King Kamehameha’s Kona Beach Hotel Beach here. This entry was posted in Beverly Hills, Central Coast, Events, Hawaii, Los Angeles, Manhattan Beach, Marina Del Rey, Pismo Beach, Redondo Beach, Weddings and tagged Beach, beachfront, California, ceremonies, coastal, oceanfront, venues, weddings. Bookmark the permalink.